The Sorento's no longer the striking value it once was, but a well-equipped V-6 with front-wheel drive and a rearview camera still stickers well below $30,000. Stick with the Sorento EX, and choose your options wisely. The 2014 Kia Sorento gets a quick fix for its minor flaws: they brighten the cabin and soften the ride. 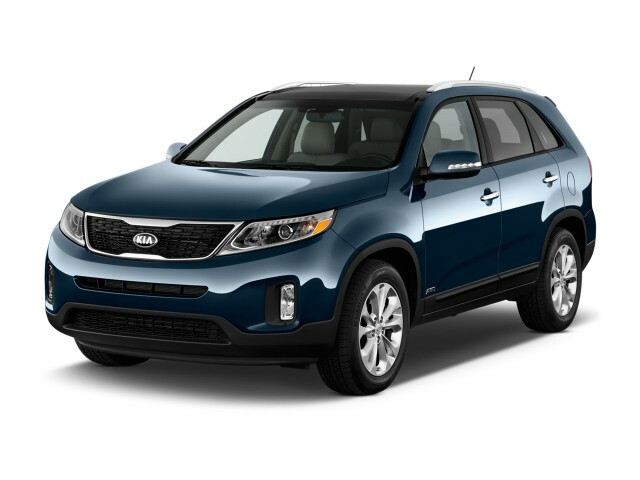 The 2014 Kia Sorento is not only the Korean company's most popular crossover utility vehicle, but a major update with some new underpinnings, significant upgrades under the hood, a new interior, and additional safety features and infotainment options. Kia says more than 80 percent of the Sorento's parts are significantly redesigned or brand new for 2014, and the result is a thorough reworking that keeps the Sorento competitive in one of the hottest segments of the market. You might not know the Sorento's been so heavily reworked just by looking at the exterior, though. The 2014 model is a clear continuation of the Sorento design in place since 2011—with a few fresh details that knowledgeable shoppers will be able to pick out. New front and rear fascias and low body work both serve to make the Sorento look a bit lower and wider, while the ‘tiger-nose’ grille gets either an anodized metal or black mesh look, with a cross-hatched pattern in the lower valance. Kia has also added LED combination taillamps and redesigned wheels. Inside, the Sorento gets a new instrument panel, while EX trims and above get a new reconfigurable seven-inch TFT LCD gauge cluster. The interior of the 2014 Sorento grows incrementally, with slightly more leg room and good seats, now with heating offered on the first two rows and ventilation available up front. We like the Sorento as a five-seater, where it has plenty of legroom and headroom for adults, front and back, yet leaves plenty of cargo space when the back two rows of seats are folded down on three-row versions. There's not much room behind the third-row seat when it's used for passengers, though. The most meaningful difference for many families may very well be the introduction of a more fuel-efficient V-6. 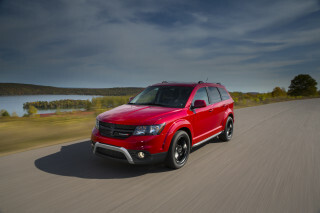 The all-aluminum 3.3-liter GDI V-6 makes 290 horsepower and 252 pound-feet of torque. A 191-hp, 2.4-liter GDI four-cylinder engine is standard, but likely to be rare--and rightly so, since the V-6 almost matches it on gas mileage, and far outpoints it in pure power. The Sorento delivers its power to the road with the help of a well-sorted six-speed automatic transmission; it's either configured with front-wheel drive or with an enhanced torque-vectoring version of the all-wheel-drive system. Other key upgrades help the Sorento ride less stiffly and steer more swiftly. The Sorento’s hydraulic power steering system has been swapped out for an electric system, and on the Sorento SX it's driver-adjustable through a range of three modes (Comfort, Normal, and Sport), to nominal effect. Ride and handling have been improved through a more rigid body structure plus the addition of a front strut-tower brace and a new independent front suspension with an H-shaped sub-frame cradle; new bushings have been added to the multi-link rear suspension. It's much calmer, and more capable of rounding off pavement burrs than before, though it's still a slightly firm setup compared to the gooey ride of a Highlander. 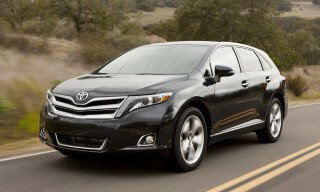 All versions get standard Bluetooth, satellite radio, and power features; a panoramic sunroof is a new option. The top Sorento SX Limited adds some of the top-lux features gained by the Optima SX this past year; it includes Nappa leather upholstery, heated rear seats, and a wood-trimmed heated steering wheel, plus a soft-touch headliner. 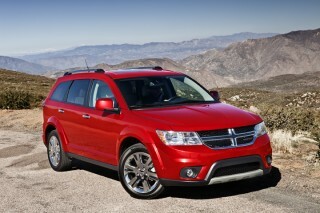 On the outside it’s distinguished by its HID headlamps, red-painted brake calipers and special 19-inch chrome wheels. The rest of the Sorento line gets an expanded feature set for 2014, and especially of note is that infotainment has been upgraded, with a large new eight-inch touch screen that combines navigation, real-time traffic, Infinity premium audio, Bluetooth, and next-generation UVO eServices features that ditch Microsoft's kludgy software for smartphone-driven access to Google maps--for free. A 115-volt power inverter, second-row sliding sunshades, a panoramic sunroof, and dual-ventilated air-cooled front seats are among the other new features for 2014. The good-looking Sorento carries over its styling, with a tasteful new interior. 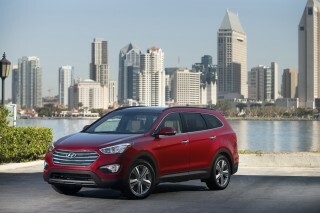 Change comes from inside: the 2014 Kia Sorento's classy new cabin proves that talk-show talking point rather succinctly. It's the obvious shift in the new Sorento, much more so than the sheetmetal, which looks about the same as last year's model. The Sorento cuts a more rugged profile than most of the crossovers of its size. 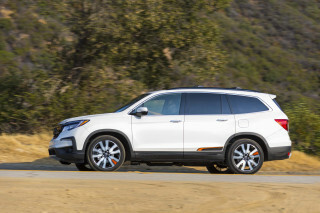 The SUV flavor isn't as faint as it is on a Highlander, or even a Santa Fe, or as overplayed as it is on the Honda Pilot. It's simply drawn, minimally detailed, and only mildly altered this year, with new front and rear ends and some trim at the sills to give it a little more mass. The taillamps are LED-lit now, of course, and the grille is either bright like metal, or a more intense black mesh on the Sorento SX. Kia's designers saved their energy instead for the cabin. It's relieved of most of the inexpensive-looking plastics that worked well enough for the past few years, and covered in finer, soft-touch materials, polished off with thin, spare metallic trim. The center stack's been reshaped to fit a bigger LCD screen for models equipped with navigation, and the gauges are recast so that an LCD screen will fit there, too, at least on more expensive models. The woodgrain trim still comes down on the inauthentic side--as does some of the real wood we've seen on other crossovers lately--but there's a substantial feel to the cabin now that matches the Sorento's silent creep in price over the past few years. Acceleration still is moderate, but the Sorento's ride is smoother than ever, thanks to a redesigned suspension. Solid but mild performance has been a hallmark of the Kia Sorento since it was new in 2011, and a pretty stiff ride has been one of its more obvious shortfalls. 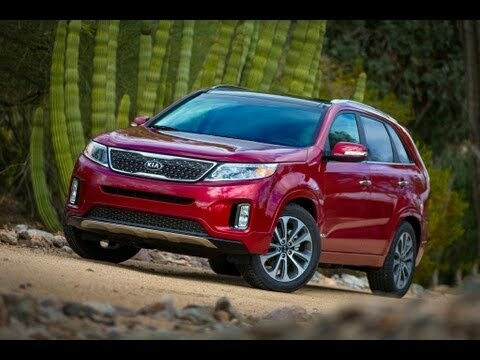 This year, the suspension's been redesigned and the powertrains have been revamped--and as a result, the Sorento's ride is more mellow, and its V-6 nets nearly 300 horsepower. The direct-injection four-cylinder is still the base engine on the Sorento, however. As rare as it's likely to be, it's worth a look, given our past experience with it. The carryover four-cylinder has 191 hp and 181 pound-feet of torque, both lean figures for a vehicle weighing in at more than 3600 pounds. Coupled to the standard six-speed automatic, the four-cylinder is offered with front- or all-wheel drive, and hangs on to its slight advantage in price and gas mileage though it's unlikely to break the 10-second 0-60 mph mark with any more than one passenger on board. 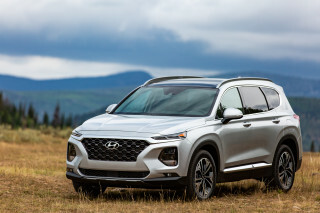 The near-mandatory engine in the Sorento is the uprated 3.3-liter V-6 shared with the long-wheelbase Hyundai Santa Fe, and spec'ed out this year at 290 horsepower and 252 lb-ft of torque. This powertrain isn't just more powerful, it's more practical given its flexibility with a fully loaded vehicle, and fuel economy not far off the four-cylinder's mark (21 mpg versus 22 mpg combined for front-drive models, for example). The V-6 works smoothly and efficiently with the six-speed automatic; though there's a sport-shift mode hanging off the shift lever, it's not very likely any Sorento driver will engage athlete mode, especially with six other passengers on board. Kia's all-wheel-drive system is an on-demand system that can send torque from the front to the back wheels as the fronts slip, and a locking differential fixes the split evenly for tackling the worst weather--not that you'll be going deeply off-road in it. There's also a simulated torque-vectoring application for the anti-lock brakes that clamps down on an inside wheel to help tighten the Sorento's line through corners. You'll give that some thought, given that the Sorento connects with the road in a more positive way than it did just last year. This year's Sorento gets better handling from a stiffer body structure, through variable-effort electric power steering (on SX models), and from additional bracing and more isolation in the suspension design. All versions have a detectable improvement in ride quality--no more pounding or thumping harshly over smaller road bumps, though new 19-inch wheels cut into that gain--and the SX versions with three-mode steering feel more engaging just from the presence of weight in Sport mode. We'd leave it in normal or comfort most of the time, but sometimes even a token gesture is a welcome one. The third-row seat's for junior petites, but the Kia Sorento's first two rows have excellent adult-sized space. At 184.4 inches long, riding on a wheelbase of 106.3 inches, the Kia Sorento has plenty of room for five passengers in its standard configuration. Two more will fit in its available third-row seat, but they'll need to be small. The Sorento has gone through a discreet transformation for 2014. It doesn't look very different, but Kia says it's 80 percent new, with small increases in leg room for second- and third-row passengers as a result of the changes. The interior room isn't very obvious at all in the front seats, where Kia already provided a good driving position and passenger space. The seats have good bolstering and wide cushions, with good adjustment range to the steering column. The redesigned center stack leaves knee room untouched--no hard points make contact--and the footwells are mostly flat. Moving through the higher trim grades adds power adjustment, heating, and ventilation, touches becoming more common in premium SUVs but still pretty rare in mainstream crossovers like the Sorento. In the second row, we've found space just as habitable, though the Sorento doesn't have the twin captain's-chairs layout of the similar Hyundai Santa Fe. The bench seat does adjust to flex leg room between the second and third rows, and by Kia's reckoning, there's more than an inch of additional leg room behind the front seats--we think, primarily, from redesigned seats. The second-row bench is split 40/20/40 and the outboard sections recline, for great nap potential, and heating is an option, another welcome premium touch. In the optional third-row seat, it's purely a kid zone. The Sorento may be a three-row crossover, but by interior volume it's smaller by a good margin than the bigger three-row utes--the Pilot, the Ford Flex, and the Chevy Traverse. The rearmost seat has minimal head and leg room for even small adults, and there's less than 10 cubic feet of space behind it for cargo--a spec that rises to about 36 cubic feet when the third row is folded down. A thorough rework of the cabin delivers a much better impression of quality inside the Sorento, and that impression extends to noise levels, too. The materials are a finer grade, particularly on the pricey SX-L, and powertrain noises are subdued on V-6 versions, with just some tire noise keeping the back-seat passengers from hearing front-seat conversations clearly. Safety is one of the Sorento's best features; both the IIHS and the NHTSA put it near the top of the rankings. The 2014 Kia Sorento has been put through the crash-test paces, and it's aced them. The National Highway Traffic Safety Administration (NHTSA) gives it five stars overall, with only a single four-star rollover-resistance rating keeping it from perfection. The Insurance Institute for Highway Safety (IIHS) dubbed the Sorento a Top Safety Pick for 2013, before it scored poorly on the new small-overlap test. The designation should be out of reach now, but the IIHS hasn't updated the Sorento's rating for the 2015 calendar year yet. Along with the usual stability and airbags--though its third-row seat isn't covered by its curtain airbags--the Sorento also has a driver knee airbag and Bluetooth as standard equipment, while a rearview camera is an option on the Sorento LX and EX. New on the Sorento's options list are blind-spot monitors, which alert the driver if vehicles are approaching in out-of-sight places. It's a useful feature that's an option on the LX and EX, and standard on the Sorento SX. Parking sensors, another handy feature for close quarters, are an option on the LX and standard on all other trim levels. Aside from those features, visibility is good from the driver's seat. The rearmost headrests mostly line up with the Sorento's rear pillars, preserving most of the view to the rear quarters. New smartphone-based infotainment and premium leather offset the Sorento's price increases. The 2014 Kia Sorento comes in three versions: LX, EX, and SX. 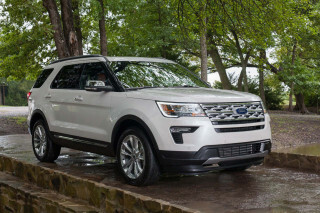 Standard on all versions are conveniences like power locks, windows, and mirrors; air conditioning; cruise control; 17-inch wheels; an AM/FM/XM/CD player; auxiliary and USB ports; Bluetooth; tilt/telescoping steering; and steering-wheel audio controls. 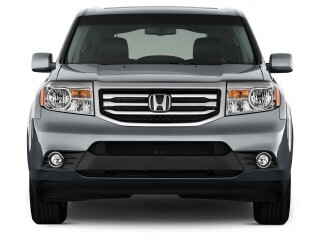 All-wheel drive and a fold-away third-row seat are options on every model. Major options on the LX four-cylinder edition include automatic climate control; a rearview camera bundled with the new version of Kia's UVO infotainment system. In this edition, UVO drops its Microsoft underpinnings and adopts a simpler smartphone-driven setup that can offer Google mapping and helpful functions like service scheduling and a parking-lot finder, all free of charge. Infinity audio, pushbutton start, a power tailgate, and blind-spot monitors and reverse parking sensors are also available. The Sorento EX adds the V-6 engine as standard equipment; it also gets a large 7-inch LCD screen between the gauges for secondary display of navigation; 18-inch wheels; fog lamps; a leather-wrapped steering wheel; a 115-volt power outlet; and a power driver seat and heating for both front seats. 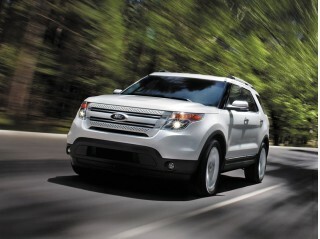 Options include a panoramic sunroof, a power passenger seat, and ventilation for both front seats. The Sorento SX gets 19-inch wheels; panoramic sunroof; roof rails; navigation; an Infinity audio system; ventilated front seats; and a power tailgate standard. The SX Limited tops off the lineup with 19-inch chrome wheels, red-painted brake calipers, and inside, Nappa leather seats, a wood-trimmed and heated steering wheel, and heated rear seats as standard equipment. Gas mileage ratings for the Sorento are solid for six-cylinder versions, more middling for the fours. The Kia Sorento delivers better gas mileage for 2014 than it did in the first half of its life cycle, with six-cylinder versions faring as well as other three-row crossovers. The front-wheel-drive Sorento is rated at 20 miles per gallon on the EPA's city cycle, 26 miles per gallon highway, or 22 mpg combined when fitted with the four-cylinder engine and automatic transmission. The numbers drop to 18/25 mpg, or 21 mpg combined in the six-cylinder Sorento with the automatic transmission. The all-wheel-drive Sorento is rated by the EPA at 19/24 mpg, or 21 mpg combined as a four-cylinder, and 18/24 mpg, or 20 mpg combined, as a six-cylinder. Compared to vehicles like the Toyota Highlander or the new Nissan Pathfinder, the Sorento's combined figures are in line, when it's outfitted with the six-cylinder engine. As a four-cylinder five-seater, the Sorento's simply pitted against more efficient and sometimes smaller-displacement offerings. Ford's Edge, for example, offers a turbocharged four-cylinder rated at up to 28 mpg highway; the Toyota Venza isn't far off that mark.